This is a vintage, handmade necktie! 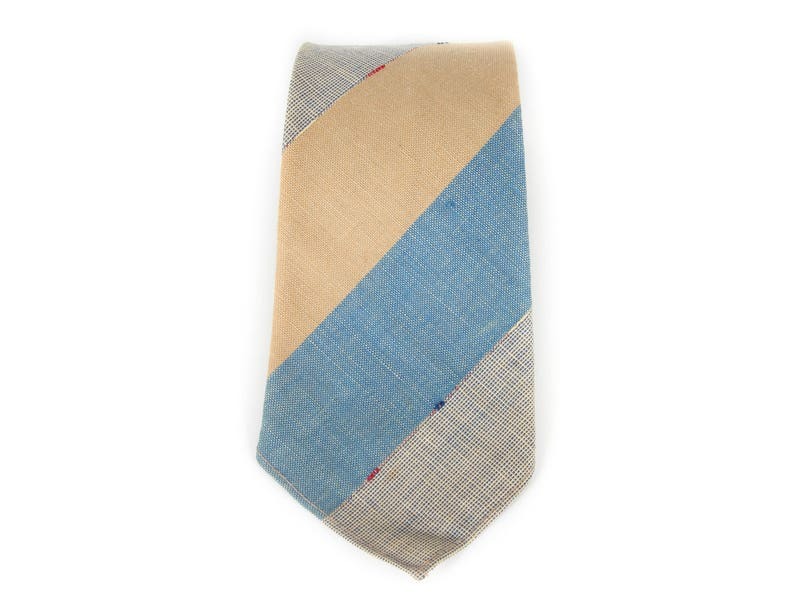 The beige and blue tie has a unique look and measures roughly 3 1/4"" wide at the bottom. Note, the tie is shorter than most common neckties and meausres 44" in total length. Contact us with any questions! - Contact us for an exact international shipping quote! - All items in my shop are vintage! They are carefully selected, but will have beautiful imperfections that add to the character. - We ship USPS or FedEx. We will figure out the fastest & safest option for your delivery! Love them!!!!! Thank you!!!! Would deal with again! The tie is beautiful and in perfect condition! Just as described; love it! Quick shipping, cufflinks as expected. Thanks! Yes. Just send us a message requesting an estimate. Note: Urban Cuff is not responsible for any duty or import taxes that may be required. We have shipped all across the US and internationally including: Canada, Japan, Brazil, England, France, South Korea, Germany, Singapore, Switzerland, Russia, Finland, Hong Kong, Cameron, Israel, Great Britain, New Zealand, The Bahamas, and Australia! We generally ship items within 48 hrs (Monday-Friday). We ship most small items USPS First Class and clothing USPS Priority. If you have a special request with shipping, just let us know!